CAIRO Islamic militants on Monday ambushed two mini-buses carrying off-duty policemen in the northern region of Egypt's Sinai Peninsula, killing 25 of them execution-style in a brazen daylight attack that deepens the turmoil roiling the country and underscores the volatility of the strategic region. Elsewhere in Egypt, longtime Egyptian leader Hosni Mubarak was acquitted Monday of corruption charges by a Cairo court, and his lawyer told CBS News he expected him to be freed "within 48 hours." The killings, which took place near the border town of Rafah, came a day after 36 detainees were killed in clashes with security forces. In all, nearly 1,000 people have been killed in clashes between security forces and supporters of ousted President Mohammed Morsi since last Wednesday. Tensions between the sides have been high since the army ousted Morsi in a July 3 coup, following days of protests by millions of Egyptians demanding the Islamist president leave and accusing him of abusing his powers. But Morsi's supporters have fought back, staging demonstrations demanding that he be reinstated and denouncing the military coup. How events play out in Cairo could largely determine whether Egypt can step back from the brink of chaos. Amid the security turmoil, the longtime ruler of Egypt who was ousted by 2011's Arab Spring-inspired uprising, Hosni Mubarak, was acquitted on corruption charges, although he is still facing charges of being complicit in the deaths of hundreds of protesters. Mubarak lawyer Fareed El-Deeb confirmed to CBS News producer Alex Ortiz that Mubarak was acquitted on the charges which stemmed from allegations that he and his sons embezzled funds for work on presidential palaces. In spite of El-Deeb's prediction that Mubarak would be free soon, it remained unclear whether Mubarak would actually be set free. He is still facing charges that he was complicit in the killing of hundreds of protesters by his security forces during the months of turmoil which led to his ouster. He was convicted and sentenced to life in prison on those charges in June 2012, but the verdict was challenged on technicalities and the case has gone to retrial. Judicial officials told the Associated Press, however, that Mubarak cannot be held in custody anymore on those charges because of a two-year limit pending a final verdict. Lawyer: Mubarak acquitted, will be free "within 48 hours"
The current security situation in Egypt, however, appears to have temporarily overshadowed most concerns about Mubarak's fate. It will have significant bearing not just on the country's long term prospects, but also on the debate playing out in Washington over whether the U.S. government should end the lifeline of financial aid to Egypt's military. Of the $1.5 billion in aid the U.S. sends Egypt every year, $1.3 billion is earmarked for the country's security forces. As CBS News correspondent Jeff Pegues reported on the CBS Evening News, there is increasing pressure on the Obama administration from within the Beltway to cut off that aid. Several GOP lawmakers have argued that the U.S. is without influence in Egypt, and therefore the only leverage Washington has left is to end its aid. However, Defense Secretary Chuck Hagel said Monday disagrees with that view of the situation, adding that the U.S. has important and complicated interests in Egypt. "I don't think the U.S. is without influence, but that has to be a collaborative effort focused on what the Egyptian people want," Hagel said. "That should come as an inclusive, open democratic process." In an attempt to counter the perception of undue force by state security personnel, Egypt's Foreign Ministry accused the foreign media on Sunday of telling only half of the story, and handed out photos showing what it purported to be armed men among the pro-Morsi protesters. It was a clear attempt, reported CBS News correspondent Charlie D'Agata, to label the Muslim Brotherhood and other Morsi backers as terrorists. On Wednesday, the military raided two protest camps of Morsi's supporters in Cairo, killing hundreds of people and triggering the current wave of violence. Gen. Abdel-Fattah el-Sissi, the country's military chief, said Sunday that the crackdown, followed by a state of emergency and a nighttime curfew imposed in Cairo and several other flashpoint provinces, is needed to protect the country from "civil war." El-Sissi has vowed the military would stand firm in the face of the rising violence but also called for the inclusion of Islamists in the post-Morsi political process. Sinai, a strategic region bordering the Gaza Strip and Israel, has been witnessing almost daily attacks since Morsi's ouster  leading many to link the militants there to the Muslim Brotherhood, the Islamist group from which Morsi hails. Egyptian military and security forces have been engaged in a long-running battle against militants in the northern half of the peninsula. Al Qaeda-linked fighters, some of whom consider Morsi's Brotherhood to be too moderate, and tribesmen have used the area for smuggling and other criminal activity for years and have on occasion fired rockets into Israel and staged cross-border attacks. A year ago, 16 Egyptian border guards, a branch of the army, were slain in Sinai near the borders with Gaza and Israel in a yet unresolved attack that is widely blamed on militants. In Monday's attack, the militants forced the two vehicles to stop, ordered the policemen out and forced them to lie on the ground before shooting them, the officials said. The policemen were in civilian clothes, said the officials, speaking on condition of anonymity because they were not authorized to talk to the media. There was no immediate claim of responsibility for the attack, which also left two policemen wounded. The officials initially said the policemen were killed when the militants fired rocket-propelled grenades at the two minibuses. Such confusion over details in the immediate aftermath of attacks is common. Egyptian state television also reported that the men were killed execution-style. The killings, which took place near the border town of Rafah, compound Egypt's woes a day after police fired tear gas to free a prison guard from rioting detainees, killing at least 36. The deaths of the 36 and the 25 policemen take to nearly 1,000 the number of people killed in Egypt since Wednesday's simultaneous assaults on two sit-in protest camps by supporters of Morsi. In the deaths Sunday of the prisoners captured during clashes the past couple of days in Cairo, officials said detainees in one of the trucks transporting them had rioted and managed to capture a police officer inside. The detainees were in a prison truck convoy of some 600 prisoners heading to Abu Zaabal prison in northern Egypt. Security forces fired tear gas into the truck in efforts to free the badly beaten officer, the officials said, adding that the people killed died from suffocation. Those officials also spoke on condition of anonymity because they were not authorized to speak to journalists. However, the officials' version of event contradicted reports about the incident carried by state media. The official website of state television reported that the deaths took place after security forces clashed with militants near the prison and detainees came under fire while trying to escape. The official MENA state news agency also said the trucks came under attack from gunmen. State media also said the people killed and the gunmen belonged to the Brotherhood. The officials who spoke to AP said some of the detainees belonged to the Brotherhood, while others didn't. The differences in the accounts could not be immediately reconciled. The Brotherhood said in a statement that it blamed the military chief, el-Sissi, and Interior Minister Mohammed Ibrahim who is in charge of the police, for the attack Sunday. The group also called for an international inquiry into the deaths. Along with the state of emergency imposed after Wednesday's crackdown on the pro-Morsi sit-ins in Cairo and ensuing street clashes across the country, the military-backed interim government has also begun taking harsher measures to cripple the Brotherhood. Security forces arrested hundreds of Muslim Brotherhood members early Sunday in raids on their homes in different cities, aimed at disrupting planned rallies to support Morsi. The Cabinet also held an emergency meeting to consider banning the group. A possible ban  which authorities say would be implemented over the group's use of violence  would be a repeat of the decades-long struggle between the state and the Brotherhood. It also would drain the group's financial resources and allow for mass arrests of its members. That likely would diminish the chances of a negotiated solution to the crisis and push the group again underground. The Brotherhood has shown no signs of backing down though. Under the banner of an anti-coup alliance, the group held protests Sunday, though many appeared smaller in scale than others held in recent days. In the coastal city of Alexandria, protesters clashed with residents. In the southern city of Assiut, security forces fired tear gas to disperse hundreds rallying in front of a mosque. "They think they can end the movement," said Muslim Brotherhood senior member Saad Emara. "The more killings, the more people join us." However, the government blames Islamists for series of attacks on churches and police stations, increasing public anger against the group. In his first public appearance since last Wednesday, el-Sissi spoke at length in an hour-long speech Sunday about the motives behind ousting Morsi. The general said the Islamist president exploited democracy to monopolize power. 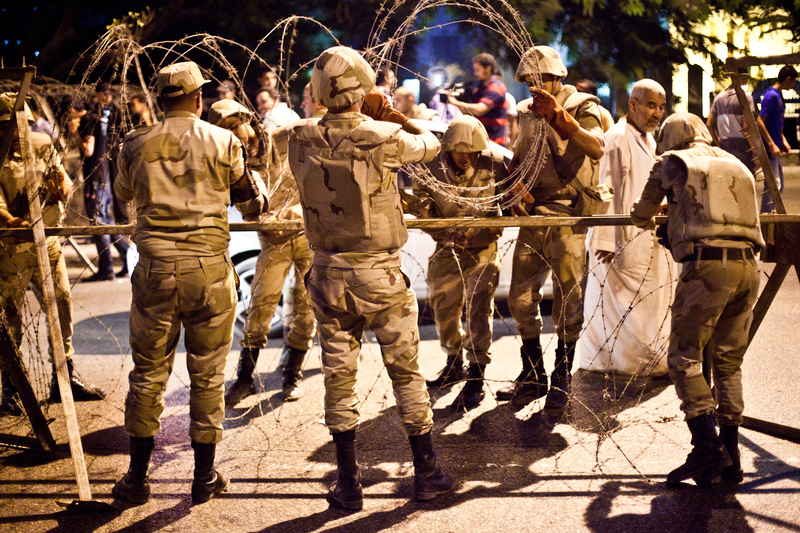 He again said the military's action "protected Egyptians from civil war," despite the ongoing violence on the streets. "We will not stand by silently watching the destruction of the country and the people or the torching the nation and terrorizing the citizens," el-Sissi said in a speech aired on state television. "I am not threatening anyone ... If the goal is to destroy the country and the people, no!" The general said that the military didn't seek power but instead "have the honor to protect the people's will  which is much dearer (than) ruling Egypt."